Cathal Geoghegan (third right), managing director of Henderson Foodservice, is pictured with Henderson and Foodco directors (from left) Pat McGarry, Gary McIlroy, Barry Monaghan, Billy Moore, Robert Walsh and Alan Kelly. 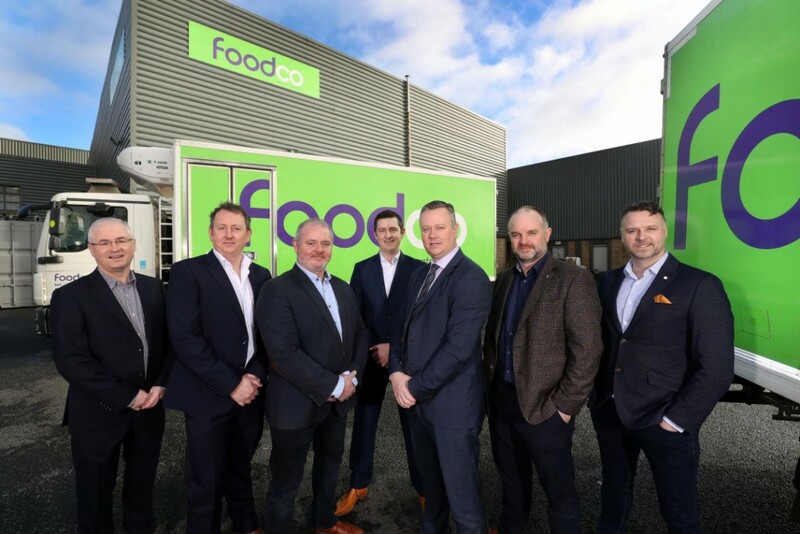 Over the last 10 years, Foodco has grown into one of the leading foodservice businesses on the island of Ireland, with a significant presence in both the north and south. The acquisition by Henderson Foodservice allows the shareholders to realise significant value while also positioning the business for further growth. Foodco was founded in 1985 and is an independently owned company with distribution depots in Lisburn and Ashbourne in Co Meath. It specialises in the supply of bespoke products to the foodservice industry throughout the island of Ireland, courtesy of a fleet of multi-temperature vehicles. It will operate as a stand-alone business with the existing management and board and will retain its corporate name and identity. “This is a great opportunity for the staff and ourselves to continue the expansion of the business by being part of one of the largest foodservice companies in Ireland. Henderson Foodservice supplies to customers across Ireland including hotels, schools, restaurants, fast food outlets, hospitals, nursing homes, cafes, sandwich bars and retail convenience stores. Despite Brexit-related uncertainty at a macroeconomic level, we continue to see significant M&A activity and remain bullish as to the deal environment over the coming months.